Vatican: SNG trucks - Globecast. 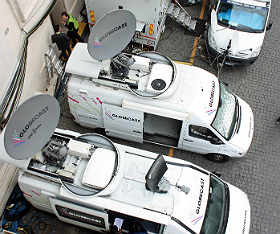 Vatican throughout the ceremony, Globecast supplied satellite uplinked video and audio services via its SNG trucks to Vatican Television, Sky Italia, Sky Deutschland, BSkyB and Eutelsat. The event was produced by the Vatican Television (CTV), in collaboration with established partners including Sky and Eutelsat. 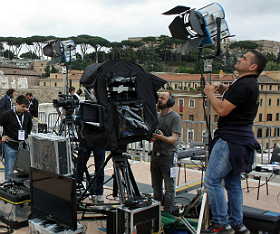 Globecast provided 3D services for Sky Italia, Sky Deutschland and BSkyB 3D channels as well as providing HD services for the Sky Italia and BSKYB News channels; HD and 3D services for digital cinema and the 4K feed for a dedicated 4K view position at the Vatican. Alessandro Alquati, Head of Global Services Contribution at Globecast says, "The participation at this historical event is a source of great satisfaction for Globecast. Thanks to our technical resources and know-how, cooperation with our partners made this historical event available to everyone across the world. Globecast confirms once again its role as a key player for the transmission and distribution of large events."